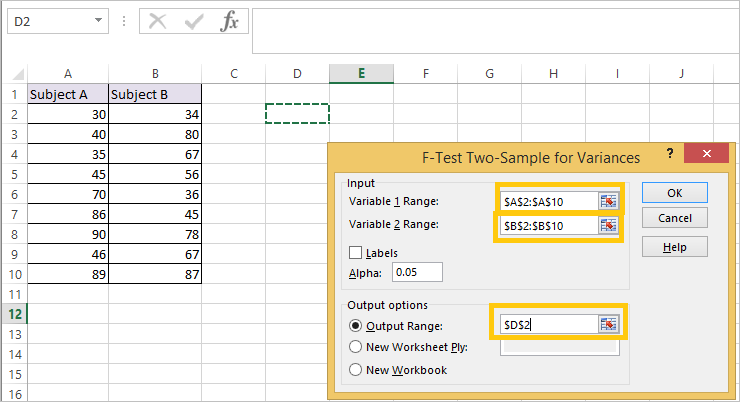 In this tutorial we will learn how to perform F Test in Excel. When we want to compare two variances we use F Test. F Test is the test of null hypothesis, which states the variance of two population are equal. Alternate hypothesis H1 states that the two population variances are not equal. 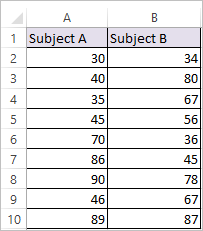 We will be using the scores of students across two different subjects to depict example on F test in Excel, Which is shown below. 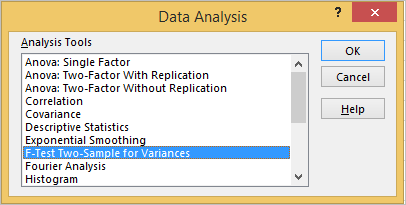 Step 2: Select F – Test Two Sample for Variances and click ok. Step 3: Click in the Input Range boxes and select the Variable 1 Range A2:A10 and Variable 2 Range B2:B10. And select the output range as D2, as shown below and click ok. Note: Variance of variable 1 should be greater than variance of variable 2. If not swap the data. F value is nothing but ratio of variable 1 variance to variable 2 variance i.e. 606.75/379.11 = 1.6004. If F > F Critical one-tail, we reject the null hypothesis. In our case F < F Critical one-tail, so we can’t reject null hypothesis. The variances of two population are equal.